All our products are Organik Indonesia Certified. Click here to view our organic certification. 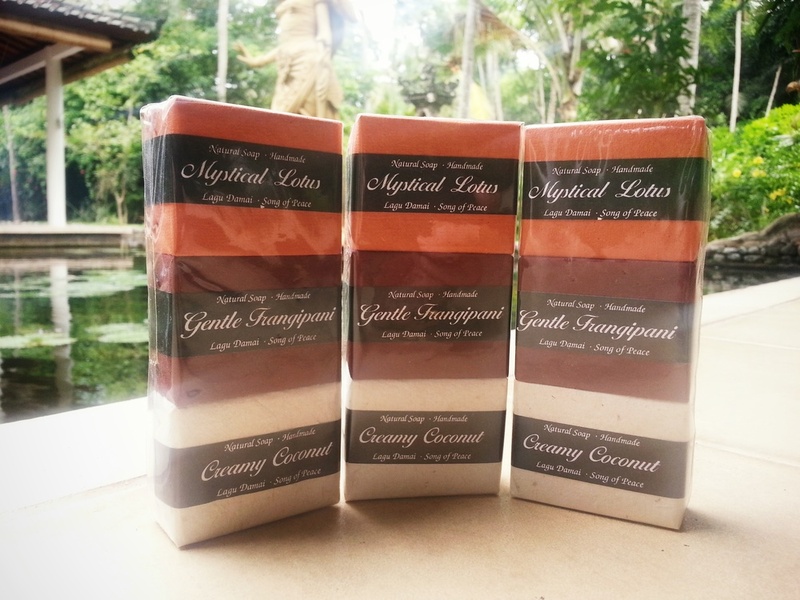 All benefits from our product sales support programs of our social –educational Lagu Damai Bali Foundation. 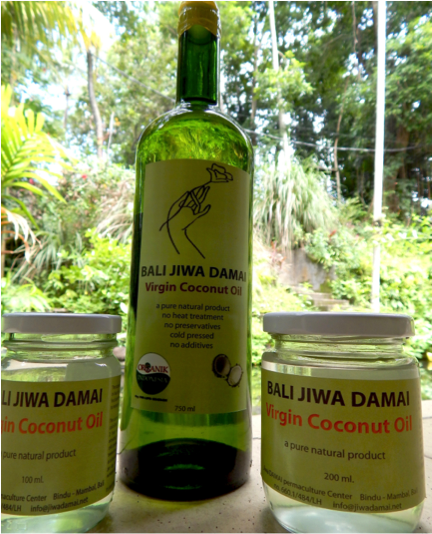 At Jiwa Damai, our organic garden is designed in accordance with agro-permaculture principles. We use EM (effective microorganisms) as well as IMO (indigenous microorganisms) to enrich our earth. No machine or chemical fertilizers are used. All plants and trees are cared for lovingly by hand. Set in a tropical region with much sun, surrounded by protective coconut palm trees, our fruit and veggies contain very high energetic-nutritional values. This is enhanced by beehives in the centre of the garden, pollinating the coconut trees as well as flowers. The trees seem to like the sound of the bees and the many birds nesting. The coconut trees have increased the amount of nuts they carry each year. All our products are hand picked and processed by hand. In Asia, the coconut trees are considered the tree of life. There are many healthy and healing ingredients found in the oil. With a shelf life of over 3 years, our coconut oil is gently processed at below 35 °C, with multiple filtering, and without any use of preservatives or chemicals. Coconut oil turns solid below 25 °C. Use it on your skin or in your foods and drinks. Our virgin oil contains up to 57% of lauric acid, also found in the mother milk, enhancing physical health and boosting the immune system. The oil is packaged in glass containers. 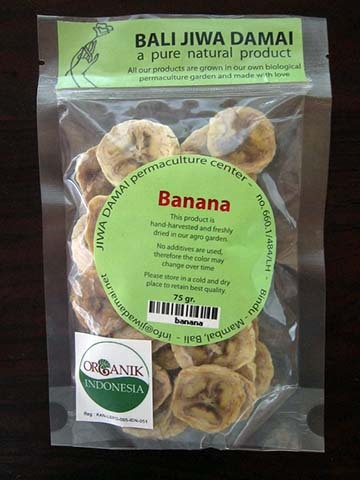 In our organic garden we grow about 8 different varieties of bananas. Each taste is unique and they are best eaten when not too ripe and the skin is still greenish-yellow. 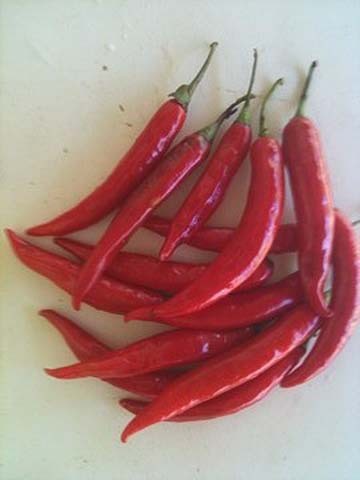 They are gently and slowly air dried in our dehydrator to keep their extraordinary flavor. Packaged in FDA approved plastic bags. Our pineapples are of a whitish color once sliced, and of surprising sweetness. They are harvested, peeled and sliced all by hand, and then placed for gentle slow air drying before packaged in FDA approved plastic bags. 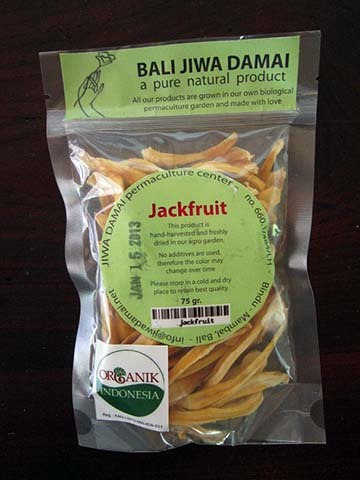 The jackfruit grows high up in the trees and can reach a weight of 10 -12 kg. Once the giant fruit is harvested, opened and its inner fruit compartments separated, the fresh fruit is available to be plucked out, its black stone removed, immediately sliced and gently air dried, thus keeping its fresh and aromatic flavor. Packaged in FDA approved plastic bags. Harvested from our chilli bushes in the organic garden, the peppers are prepared by slicing each bean individually, taking out the seeds, and placing it for the air drying process. This way they retain their sweetness and hot flavor. Our products are packaged in FDA approved plastic bags. All our hand-picked tomatoes are sun ripened and grown in organic earth. Their flavor is unique. This uniqueness is preserved through the careful and gentle processing, sliced by hand, air dried and packaged in FDA approved plastic bags. 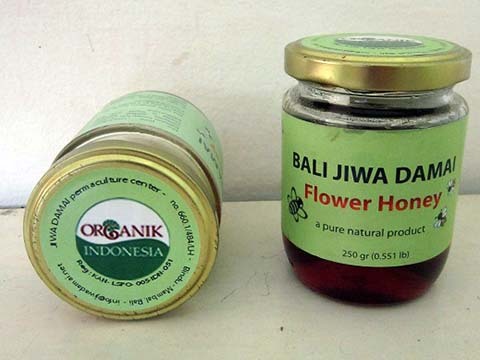 We have two areas where the honey is produced. One in our organic garden where the bees interact mainly with the coconut trees and flowers, the other in the forests of the highlands where they pollinate the wide variety of the tree flowers found there. The taste is a unique bouquet of aromas of wild flowers. 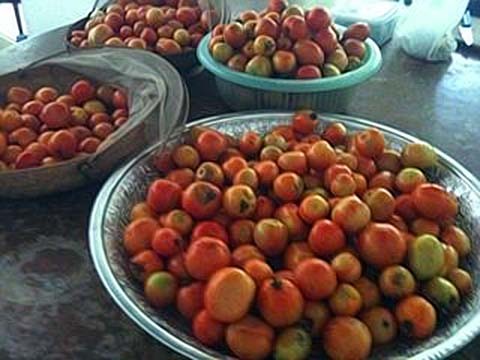 Highly nutritious and is locally also used to put on stings and wounds for healing. Packaged in glass jars. 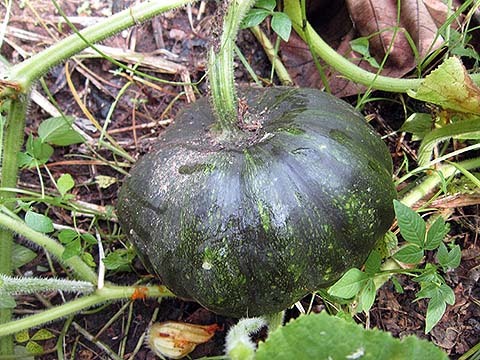 Grown in our organic garden, our pumpkins are full, ripe, and sweet. 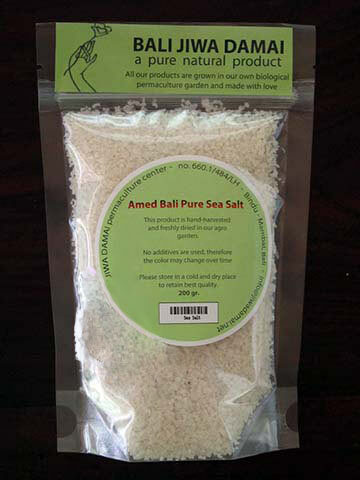 Flavored with a pinch of natural unprocessed sea salt from Amed beaches in Bali, they can be enjoyed as a nutritious snack or cooked as a vegetable. They are so good we have to cover them in the garden so the chipmunks don't eat them! 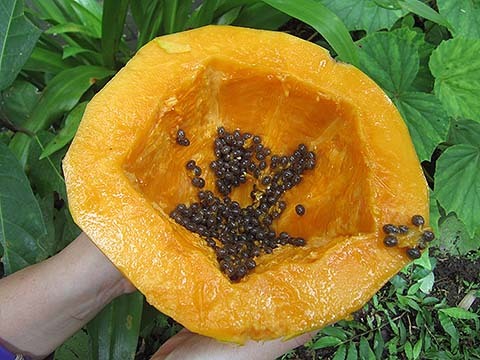 Harvested from trees spotting our garden, our papayas are plump and juicy. When dried, the flavor pops and they make a delicious snack for any time of day or a vitamin-packed addition to any meal. The meat of coconut ground into a fine flour used for all baking and cooking purposes. No additives, just pure, fresh, coconut meat picked from one of our local trees. It is gluten free, hypoallergenic, and high in fiber and protein. We offer many cooking suggestions on the back of the package. Moringa leaves are the most nutritious part of the plant, being a significant source of B vitamins, vitamin C, provitamin A as beta-carotene, vitamin Ki, magnesium and protein, among other essential nutrients. 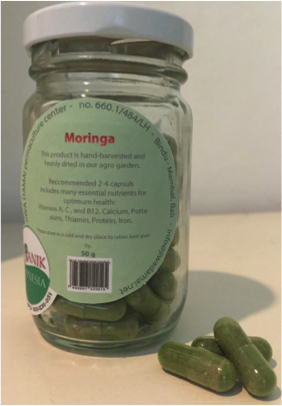 Moringa leaves have seven times the Vitamin C of oranges, four times the calcium of milk, four times the vitamin A of carrots, three times the potassium of bananas, and two times the protein of yogurt. 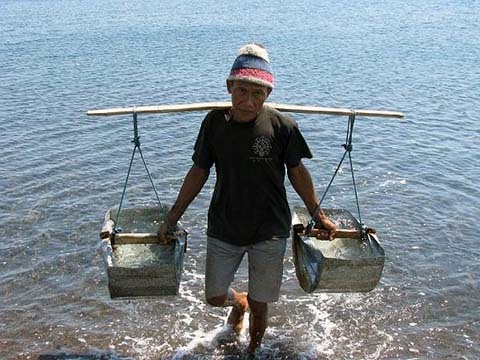 Purified right on the seabed in Amed, Bali, the result is large salt crystals with a gentle and soft flavor that is not too strong. With no additives or fluoride, enjoy the pure taste of the sea. Named after our educational social foundation, our gentle soaps are handmade from coconut oil and three distinct aromas: coconut, lotus and frangipani. It contains mainly natural ingredients to allow for a foaming experience. We suggest using it as a shampoo as well. View our full product list with costs.